It is a finger licking cake & is te easiest process of making red velvet cake wen u r short of time & ur kids have invited their friend over. And it will vanish in no time. 1 pack white cake mix( use the method in the box). Add to the mix, 2 tsp coco powder. You can do this in layers or a whole cake, depending on that grease your pans with a little oil. Pre heat over to 350 deg. In a bowl combine the cake ingredients & beat on high speed for 3 min. pour the mix in the pan or pans. Bake as prescribed in the pack. Remove from heat & cool completely. In another bowl combine the icing items(except the food colour) & beat till nice & creamy. Bring your cake out of the pans & spread the icing evenly over it (leaving a little icing on hand), either by layering (it if you have made 2 cakes) or above one cake. Combine the food colour in the little icing that you had left out & mix to a nice red colour icing. Drizzle it over the white iced cake & serve. Thanks rabz i did'nt knew icing procedure it luks superb. Thank u Satish it is always good 2 have someone who doesn't like ur things, since not every cup of soup is 2 our taste in life.I am sure u will find many recipes u will enjoy on KK. Cheers. Hi Mrs Roy it's 350 deg F.Hope u enjoy making & eating it. Cheers. Its really an awesome recipe and dying 2 try it out ASAP..can u plz confirm me the degree- in C or F? Thanks Arti, I even made it yesterday & it has vanished.Cheers. 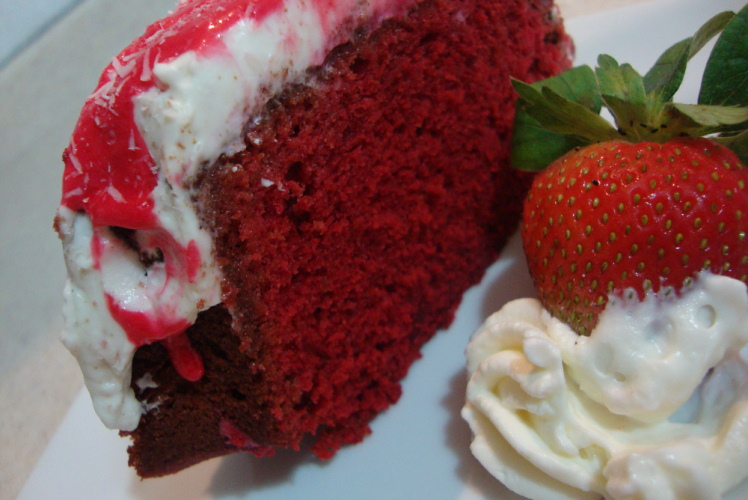 Hi Rabz, nice and simple cake recipe....thanks for sharing! Thanks dimps & hanabee, It is one of my fav cakes 2, just keep in mind tat te icing is te heart of tis cake.Cheers. Hi Rabz I haven't tried this one yet but I looked up some of your recipes and tried some out too but I must say, to me your dessert and tea item recipes are outstanding and one of the best on Khanakhazana. Thank you. Hi rabz, had this once and it tasted so good, I am sure going to try this out.Thank you for sharing.